Have you ever thought of eating insects? I’m sure it might have crossed your mind at some point. Well, scientists have identified close to 2000 species of insects as edible. The practice of humans eating insects as food is known as Entomophagy. Many countries in Africa. Asia, Central and South America regularly eat insects as food. The Food and Agriculture Organization (FAO) of the United Nations (UN), estimated that up to 2 billion people world feed on insects as a diet. Many people in the Western world are however still reluctant to try eating insects. Well, today you be learning why edible insects are good for you and since we care about your health, you’ll also find out the health benefits of top edible insects. • Insects are immensely packed with enough protein. Protein from insects contain all nine of the essential amino acids required for human nutrition. • Eating edible insects would save you a lot of money used in other foodstuffs. • Eating edible insects could help overcome obesity and lose weight. • Entomophagy can help solve the problem of malnutrition in the world. Now that you’ve understood some of the benefits of edible insects, let us now see some common edible insects and their health benefits. Mopane caterpillars is a popular food consumed in parts of Southern Africa, especially in northern Zambia. Caterpillars contain 25-53g of protein and 20g of healthy fat from monounsaturated sources. However the interesting thing about caterpillars is their iron content. The iron content in beef is 6mg per 100g of dry weight, in contrast the iron content of caterpillars is 31mg per 100g. According to the World Health Organisation (WHO), iron deficiency is the most common nutrition disorder in developing countries. Eating edible caterpillars could help improve your iron content. They are also good sources of potassium, sodium, calcium, phosphorous, magnesium, and zinc. Termites are a popular food in Western Africa and Asia. Termites are nutritionally rich insects and have a lot of wonderful health benefits. Termites are rich in iron, calcium, sodium and manganese. They also contain information vitamin A, vitamin C, and essential fatty acids. Termites are said to have antiviral and antibacterial properties. The high amountil of calcium and iron makes them essential to pregnant women. 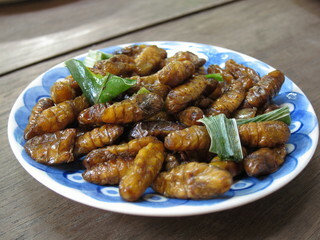 This tiny insects that is known for making chirping noises, can be an exciting delicacy. They extensively sold in Mexican markets, and eaten in many parts of Central Africa. Crickets, like other day edible insects are very rich in protein, they are also good source of unsaturated fat, but are notable for they extremely high potassium content. Their high potassium content can help you fend off a number of heart-related diseases. According to the Food and Agriculture Organization of the United Nations, (FAO), it can help lower the risk of high blood pressure. Because of the fact that their are high in potassium, they can help reduce bloating. Bloating is caused excessive sodium intake from salty foods. Eating crickets will help you get rid of that can could give you a great belly. They also supply a small amount of Iron too. Ants are everywhere, they even have more population than humans. Eating ants has a lot of amazing health benefits. They are so great in proteins and contain numerous minerals. Ants contain iron, zinc, copper, potassium and calcium. Ant protein has a lot of health benefits like, decreasing fatigue, improving immune function and enhancing growth. However you don’t just go eating any ant. A recommended form for getting this wonderful nutrient from ants are Ant powder. Ant powder extract can be incorporated in drinks, or cooked with just about any kind of food. It’s the same as any protein powder. They are also many ant recipes to try out on the internet too. Grasshoppers are found in temperate climate and inhabit similar terrain with crickets. This small insects that hops about and makes chirping noises in your yard can serve as a staple food. And above all it has wonderful health benefits. Grasshoppers contain a lot of protein that can serve the good percentage of the protein requirements for both men and women. What makes grasshoppers one of the healthiest edible insects is because it is a good source of unsaturated fats and essential vitamins. Note: Care should be taken when feeding on insects because some of them could be toxic due to exposure to harmful pesticides. 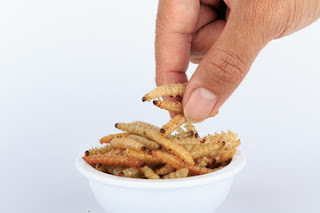 Buy edible insects from reliable sources to gain their amazing health benefits. Their are also great insects recipes all over the internet that you could try. Remember to always Eat Healthy!